Looking for sales data to connect with your target prospects in Washington? Blue Mail Media offers highly reliable Washington Business Executives Mailing List to help you run your multi-channel marketing campaigns with ease. We have a strong data repository of wide-ranging industries, businesses, C-Level executives, and thousands of professionals across Washington. Blue Mail Media has emerged as one of the top data marketing solutions providers in the US and provides marketing data customized to client’s specific preferences. 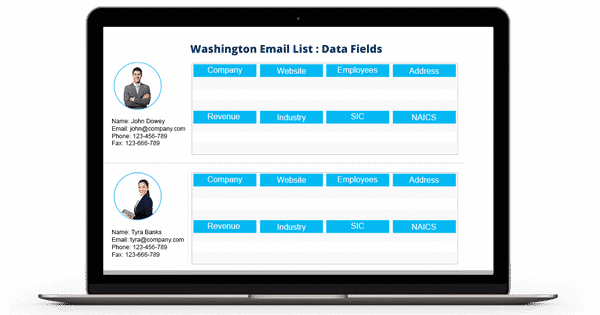 Whether you wish to connect with your target market via telephone, email or mobile, our Washington Business Email Database helps you achieve the purpose flawlessly. Blue Mail Media provides pre-packaged as well as customized database for the industry and region of your interest. Over the years, we have been able to develop a deep understanding of clients’ challenges and thus offer to customize our database based on various selects such as SIC/ NAICS code, job Role, scale of operations, staff size, among many other selects. Our Washington Business Executives Email List offers you a competitive advantage in terms of expanding your business in Washington. Irrespective of the region or industry your business operates in, Blue Mail Media can offer you qualitative data to efficiently run your multi-channel marketing campaigns. Using our Washington Business Directory, you are sure to achieve a higher response rate, conversions and eventually greater RoI.